9x12, xv + 104 pp. Oxford, Bodleian Library, MS. Mus.Sch.D.219, and Oxford, Christ Church, Mus. 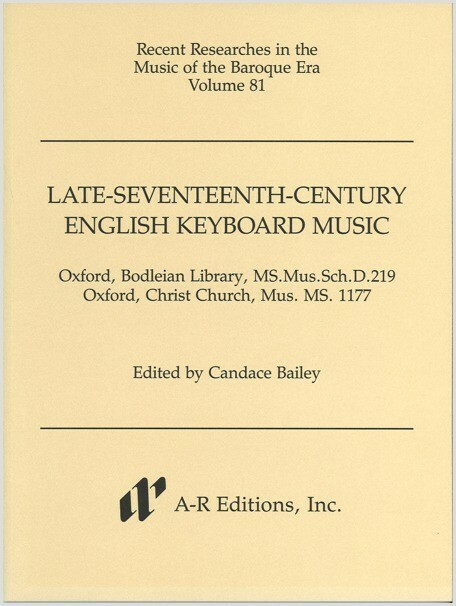 MS 1177, contain more than eighty pieces that vividly depict English keyboard music of the late seventeenth century. Two copyists entered various kinds of works into these manuscripts: suites, keyboard transcriptions of instrumental pieces, grounds, preludes, a verse, and arrangements of popular tunes. Many of the compositions are unica and are published here for the first time. This collection consists of music from two successive generations of composers. The earlier group includes less familiar works by Matthew Locke, John Roberts, and Albert Byrne—all composers who made significant contributions to Restoration keyboard literature. This is the tradition in which the next generation, most notably John Blow and Henry Purcell, learned their art. The later pieces in this edition include some of the more famous keyboard music by these latter two composers.